Xcel Delivery Services offers a full suite of same day delivery services for your orders that are urgent. 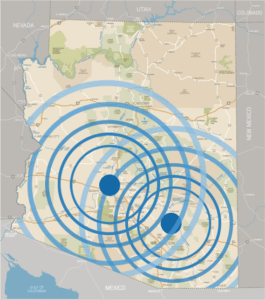 Whether you require a local delivery or a run to Phoenix or any other part of Southern Arizona, we have the capabilities to optimize solutions for your logistics needs. Instead of having to wait until tomorrow for a pickup, you can count on your package being picked up and delivered today. Our wide array of transportation options and vehicle types (car, cargo vans, straight trucks, lift gate truck and stake bed truck) allows us to quickly and efficiently implement a delivery solution that meets both your cost and time requirements to make any, deadline you have. It doesn’t matter if you have documents to be delivered or a large pallet of goods, we can make it happen in a professional and expedited manner. We have dock-to-dock expedited services that are available for every time sensitive rush pickup and delivery you need completed. Many businesses find that they have needs for a delivery in other cities across the state. All dedicated same day requirements can easily be handled by our expertise staff of professionals here at Xcel Delivery Services so you don't have to worry any longer about whether you are going to have an on time delivery issue or tracking question regarding the delivery of your paperwork or products that is so time-sensitive. Our courteous and customer oriented staff always makes sure you know where your shipment is, from the pick-up point to destination, by providing live tracking information and confirmation of delivery via electronic notification. We can even provide confirmation via phone call, if desired. Our facility uses the latest tracking technology to track job progress. At any given time we can check a drivers progress and communicate that information so that you can know where it is and when it will be delivered.